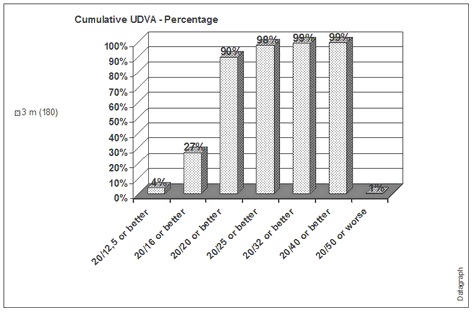 This graphs shows the distribution of post operative uncorrected distance visual acuity (UDVA). It shows the percentage of patients reaching a certain level of unaided visual acuity. It is one of the most important measure for patient satisfaction after refractive surgery. 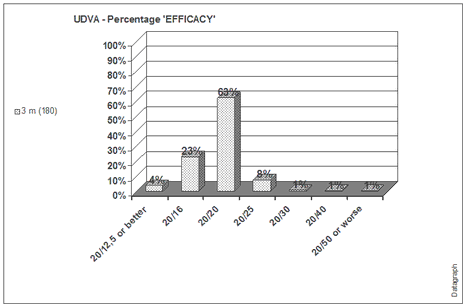 Note that under 'Distant Visual Acuity' we offer a slightly different graph called 'Cumulative UDVA' which may be better representing the postOP UCVA distribution than the classical Efficacy graph. It is the same data, just adding up the percentage of each UCVA group from left to right, showing the percentage of eyes which achieve a certain VA level 'or better'.